Coningsby Football Club have received a new strip from sponsors SB Barker Ltd of Coningsby. Pictured are the first team players, who will be competing in the Boston and District Premier League this season, together with committee members and Cyril Kirk, managing director of the firm which has now sponsored the club for more than 30 years. Billinghay Athletic endured a nightmare ending to their home game against Swineshead Institute in the Taylors Garages Premier Division on Saturday. The hosts were leading 1-0 thanks to a Michael Cliffe opener as the game entered the final 15 minutes, only for the Tutes to run out 4-1 winners. Cliffe could have sealed victory earlier for Billinghay, but saw one effort strike the crossbar and two glaring openings from close range go begging. For Swineshead, those late strikes came from Richard Barker (two), Kieran Rose and Bert Snaith. Shane Brackenbury, a close-season transfer from Sibsey to Wyberton experienced a mixed debut for Wyberton Reserves at Benington. He scored one of his side’s goals in a 2-1 away win but then got himself red-carded. Liam Shinn grabbed the other Wyberton goal while Lewis Mundt hit back for Benington. Pointon went goal-crazy against a sorry Kirton Town side with strikers Ian Jacquest and Gary Handley boosting their early-season goal totals. Jacquest grabbed four goals while Handley hit a hat-trick in an 8-1 trouncing. Nathan Wilson helped himself to the other goal while Kirton will continue their re-building to get back on track. Ruskington Rovers pulled out of their away fixture at Spilsby Town due to a lack of players and the probable outcome will be the award of three easy points for Town. In the Taylors Peugeot Division One, an eight goal thriller at Swineshead Reserves saw Fosdyke go down 5-3 in a very tough but evenly-fought encounter. Reece Fletcher, Leon Marsh and Matthew Scott were on target for Fosdyke but Jack Houghton, Ben Houghton, Andrew Bullman, Tom Ruck and an own goal settled it for Swineshead. Friskney snatched victory at FC Magnet, winning 3-2 desdpite goals from Daniel Bourne and James Ford. Boston College and Leverton fought out a tight 0-0 draw. Fishtoft Reserves made it two wins out of two with a 5-3 home win against FC Kirton in the Taylors Ford Division Two. Jack Cridland struck two goals for Fishtoft while Joe Pitcher and Owen Morgan also got on the scoresheet. The best goal of the game came from Sam Duff who controlled a ball with his chest then knee before rifling home a superb volley. Eastern European FC got their first points on the board with a double-figures home win against Mareham United. Tomas Ragelis and Patryk Wachowicz both scored twice in a 12-1 victory, while the other goals came from Damina Citko, Szczepan Swiech, Karol Kozletcki, Andrzey Sydor, Marcin Mincyniuk, Ruslan Dulkalskis, Radoslaw Kosieradzki and Piotr Puchala. Holbeach Bank beat Swineshead A 1-0. Pointon Reserves and Kirton Town Reserves were involved in another goal bonanza , Town leaving with a 9-2 success. Pointon’s only consolation came in the form of goals from Luke Thomas and Robert Rowlatt and they also suffered a bad ankle injury to Sam Elliff, who was forced to endure an uncomfortable wait for the ambulance to arrive. In the Taylors Vauxhall Division Three, Travis Herberts was again amongst the goals for Spilsby Town Reserves at Wyberton A following a 3-1 away win. Hot-shot Herberts followed up his opening day four-goal salvo of last week with a double this time around while Elliott Ludlow grabbed the other Town goal. Peter Lovelace replied for Wyberton. 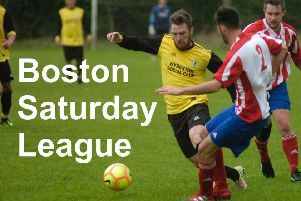 Leverton Reserves’ first competitive game in the Boston Saturday League ended in a 2-2 draw against Northgate Olympic. After trailing 2-0 at half time, Leverton levelled through two Jack Mitchell penalties. Old Doningtonians beat Boston Titans 4-0. The Dons had veteran Andy Barnett in goal while his 16-year old Luke provided two assists as goals came from Shawn Scott, Ben Pell, Daniel Clay and Ricky Mason. Friskney Reserves found themselves without a game after FC Boston failed to show up for their contest.